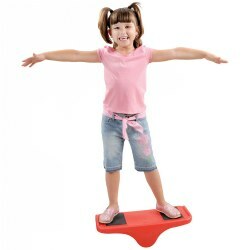 Facilitate the development of balance and coordination by providing children with a variety of active equipment options. Strengthening balance and coordination provides children with a strong foundation for success in other gross motor activities. Kaplan offers balance beams, balance boards, see saws, rocking horses, trikes and more for individual or group use as well as indoor and outdoor activities. All ages. Stretch your way to a fun and healthy lifestyle with each of the fifty yoga poses in this colorful deck. These cards include forward bends, back bends, partner poses, and balance poses. Includes 50 cards and a leaflet. 3 years & up. Balance the ball on the paddle and race to the finish line! 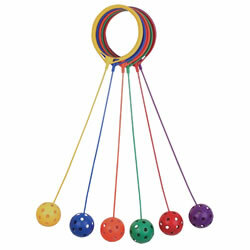 These colorful paddles and balls will help promote balance, patience, and coordination in your child. 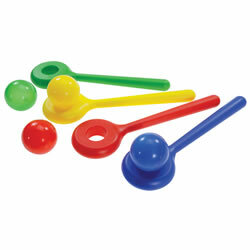 Set includes four paddles and four balls in four colors. 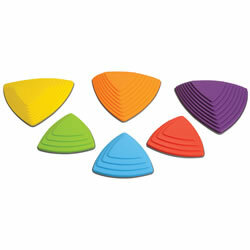 Bilibo's unique conic shell shape and bright colors immediately appeal to children of all ages who will intuitively create games. Developed by Zurich University's children's hospital to engage imagination and stimulate the senses and encourage creativity. Use indoors and out, right side up and upside down. Add a museum piece to your playground or even sand and water area. Color may vary. 3 years & up. Learn to balance by using these plastic can-shaped stilts. Comes with adjustable hand cord and non-marring rubber base rim. Supports up to 175 lbs. Set of 6 colors. 3 years & up. Watch balance skills improve after a few trips around the Step-A-Logs! Begin by organizing logs in a straight line then move on to curves and more challenging log placement. Logs feature raised dots for safety and tactile stimulation. Logs extend over 15 feet and can be moved from straight to curved position, increasing the challenge. This game allows for physical activity as well as improving the sense of balance. 2 - 7 years. 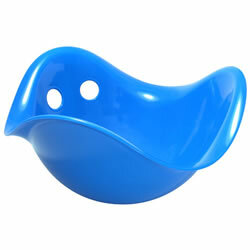 A spherical rocking toy for hours of fun indoors or outdoors. 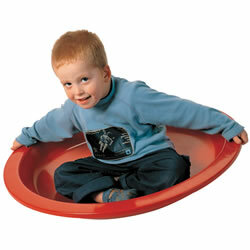 Children can sit in it and rock from side to side, or spin around. There is even room for two smaller children to sit in it together. Users can hold on to the rim without getting their hands jammed between the rim and the floor. Develops physical coordination skills. 2 years & up. 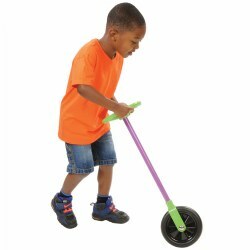 The Go Wheelie is a fun and safe way to encourage imaginative and open-ended role play. 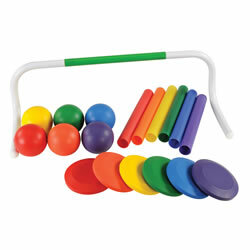 Assists in developing balance and hand-eye coordination skills. Great for indoor and outdoor play. Measures 23 1/2" high. 4 years & up. These track and field activities are sure to get children excited while enriching gross motor development. 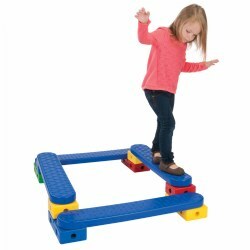 Builds coordination, balance, muscle strength, and control. Kit includes 6-8"H Return-To-Right hurdles, foam discus set, baton set, and foam shot put set. 3 years & up. 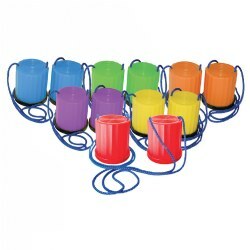 Engage in large motor balance activities with this 12-piece set. 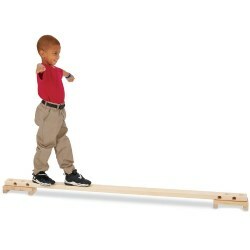 Balance beams can be arranged at different levels and angles to encourage creativity and coordination. 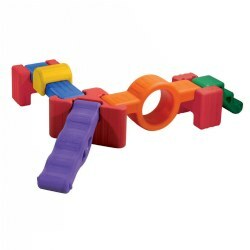 Includes four balance beams, four bricks, and four half bricks. 3 years & up. 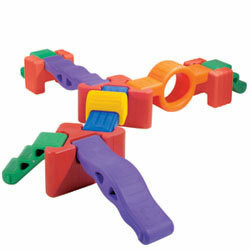 Create an entire obstacle course with this versatile set. 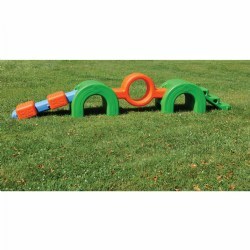 Over thirty pieces allow for activities such as limbo, jumping, tossing, and crawling. 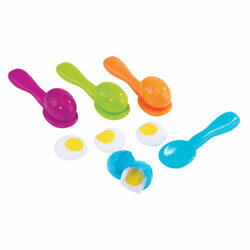 Pieces can be assembled in a variety of ways for endless activities. 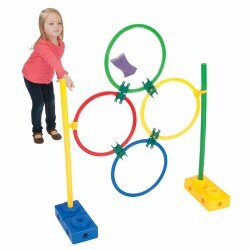 Includes four poles, six bricks, four half bricks, four 23 1/2" hoops, four 14 3/4" hoops, six hoop-to-hoop clips, and six hoop-to-pole clips. 2 years & up. A soccer set is a fun way to build gross motor skills and coordination. Lightweight goal is constructed of heavy-duty metal for durability, adjustable net height, and is easy to disassemble for storage. Includes a soccer ball and pump. 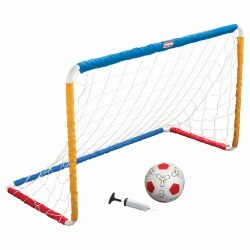 Goal measures 48"W x 18"D x 30"H. Adult assembly required. 4 years & up. Take active learning to a whole new level! Stand on the colored circle mats, then roll the jumbo cubes to see which exercise to do and how many times to do it. 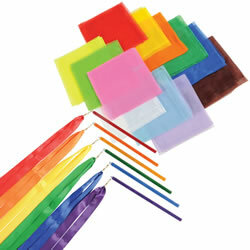 Supports classroom management and encourages student response as you use versatile mats to create small groups. 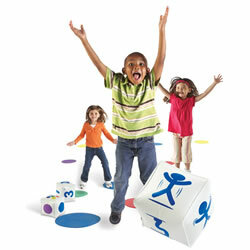 Features 25 durable foam circle mats (10"), 3 inflatable cubes (5"), and an activity guide. 3 years & up. Challenge balance for beginners and experts. Solid 6' long beam of hardwood with two stable bases. Beam is 2 3/4" W on one side and 1 1/4" W on the other. Approximately four inches high. Popular children's music artist and yoga expert Bari Koral is a pioneer in the area of yoga for children. You can lead children on beloved adventures using the yoga, music, and movement activities featured in this Bari Koral yoga set! 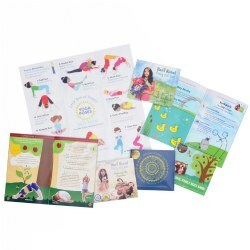 The set includes 4 CDs, 2 full-color activity books, and a yoga pose poster. 3 - 6 years. 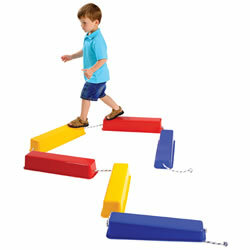 The Crazy Wave gives kids a new challenge of ups and downs and has easily adjustable tactile sensory bridges. Seven piece set: 2 tunnels, 1 tunnel beam, 1 stair/slope, 1 straight beam, 1 textured bridge, 1 studded bridge. Includes instruction booklet. Does not meet CPSC or ASTM standards for public playgrounds. 3 - 6 years. 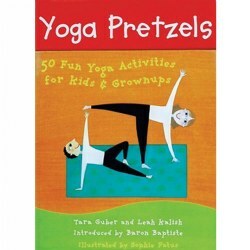 Yoga for Kids DVDs encourage playful stretching while children engage in creative body movements. Children will learn to stand like graceful flamingos, create alphabet letters with their bodies, and shift their minds from silly to steady, restless to relaxed, boisterous to balanced. Each DVD provides 35-40 minutes of yoga. Available separately or in a set of three. Please note: DVD cover art may differ from what is shown, but the contents are the same.